On the 24th (Sun), you'll have a packed day of sightseeing: delve into the distant past at Medinet Habu, then explore the ancient world of Valley of the Kings, and then pause for some photo ops at Temple of Hatshepsut at Deir el Bahari. 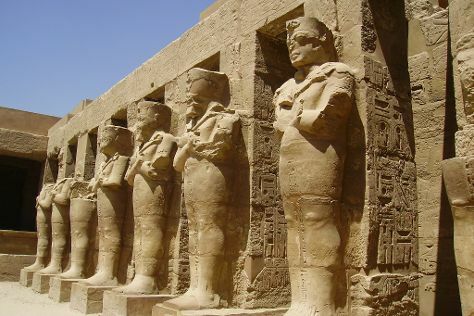 To see ratings, reviews, more things to do, and other tourist information, read our Luxor trip planner . Singapore, Singapore to Luxor is an approximately 14-hour flight. The time zone changes from Singapore Time (SGT) to Eastern European Time (EET), which is usually a -6 hour difference. When traveling from Singapore in June, plan for a bit warmer days and about the same nights in Luxor: temperatures range from 49°C by day to 30°C at night. Cap off your sightseeing on the 25th (Mon) early enough to travel to Giza. Situated on the Nile riverfront, the city of Giza remains best known for its pyramid complex. Kick off your visit on the 26th (Tue): appreciate the history behind Great Sphinx, then steep yourself in history at Khafre's Pyramid, and then examine the collection at Egyptian Antiquities Museum. For ratings, traveler tips, where to stay, and tourist information, you can read our Giza day trip site . Traveling by combination of flight and train from Luxor to Giza takes 2 hours. Alternatively, you can drive; or take a train. Prepare for little chillier weather when traveling from Luxor in June: high temperatures in Giza hover around 40°C and lows are around 26°C. Finish up your sightseeing early on the 27th (Wed) so you can travel to Marrakech. Kick off your visit on the 28th (Thu): steep yourself in history at Medina of Marrakesh, admire the striking features of Ben Youssef Madrasa, and then don't miss a visit to Koubba Almoravid. On your second day here, admire the striking features of Koutoubia Mosque and Minaret, stroll the grounds of Saadian Tombs, then admire all the interesting features of Menara Gardens and Pavilion, then admire the striking features of Bahia Palace, and finally contemplate the long history of Mellah. Plan trip to Marrakech with our itinerary maker to find out where to go and what to do. You can do a combination of train and flight from Giza to Marrakech in 11.5 hours. You'll gain 2 hours traveling from Giza to Marrakech due to the time zone difference. Expect slightly colder evenings in Marrakech when traveling from Giza in June, with lows around 20°C. Finish your sightseeing early on the 30th (Sat) so you can travel to Johannesburg. On the 1st (Sun), examine the collection at Apartheid Museum, then contemplate the long history of Mandela House, and then contemplate the long history of South Western Townships. To find more things to do, photos, traveler tips, and tourist information, refer to the Johannesburg day trip tool . Getting from Marrakech to Johannesburg by flight takes about 17.5 hours. Other options: do a combination of train and flight. Traveling from Marrakech to Johannesburg, you'll lose 2 hours due to the time zone difference. Prepare for colder weather when traveling from Marrakech in July: high temperatures in Johannesburg hover around 22°C and lows are around 5°C. 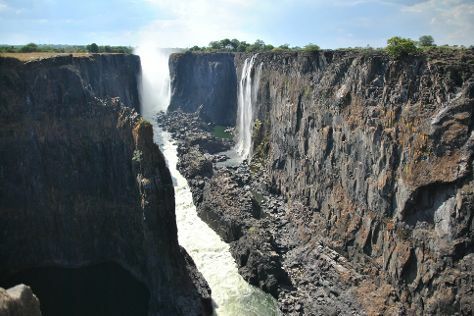 Finish up your sightseeing early on the 2nd (Mon) so you can travel to Victoria Falls. Kick off your visit on the 2nd (Mon): admire the sheer force of Mosi-oa-Tunya / Victoria Falls National Park. To find where to stay, photos, more things to do, and other tourist information, read Victoria Falls tour planner. Fly from Johannesburg to Victoria Falls in 3 hours. Alternatively, you can do a combination of flight and car; or drive. Prepare for somewhat warmer weather when traveling from Johannesburg in July: high temperatures in Victoria Falls hover around 28°C and lows are around 9°C. Wrap up your sightseeing on the 3rd (Tue) early enough to travel to Cape Town. Get some historical perspective at Robben Island and Groote Kerk. Step out of the city life by going to Cape of Good Hope and Table Mountain National Park. Next up on the itinerary: kick back and relax at Boulders Beach, admire the natural beauty at Kirstenbosch National Botanical Garden, examine the collection at South African Jewish Museum, and get to know the fascinating history of Maclear's Beacon. To see other places to visit, reviews, and more tourist information, read Cape Town travel itinerary planner. You can fly from Victoria Falls to Cape Town in 4 hours. Alternatively, you can drive; or do a combination of bus and taxi. While traveling from Victoria Falls, expect little chillier days and about the same nights in Cape Town, ranging from highs of 20°C to lows of 8°C. Wrap up your sightseeing on the 7th (Sat) to allow time to travel back home.